Even when faxes were in widespread use, dropped calls and shaky transmissions made them an ineffective means of communication. In the 21st century, you generally don't need a fax machine in the office unless your industry demands it. Of course, there are ways to send faxes without a fax machine. But how can you be sure the recipient will accept your signed form as coming from your own hand? A digitally-signed document employs several levels of cryptography to keep your signature secure, along with a timestamp to show when it was signed. There's also usually a verification component to prove that it came from the signer. Here are several tools that let you make digital signatures and abandon that dinosaur fax machine for good. Adobe Reader's latest update allows all users to sign PDF documents with digital signatures. With the new system, you can take a digital image of your signature and import it into the document, or use the Only I Sign feature, which lets you either draw your signature with a mouse or type it in. The same update includes a Send for Signature function that allows you to send off a document to be signed and returned to you. The update incorporates technology developed by Echosign, a company which Adobe purchased last July. When you've downloaded and installed the newest version of Adobe Reader, you'll be taken to a welcome screen. From Adobe Reader to EchoSign's site, the process of signing digitally is straightforward. Click on Get Documents Signed Online to be sent to the EchoSign website, where you're invited to start a free trial without a credit card. Once you've created your account, you'll be able to upload or choose the documents you want signed. From there, the process is very straightforward and simple to follow. During the free trial, you're allowed up to five signatures for 30 days. After the trial expires the service starts at $14.95 per month and goes up to $399 per month based on number of users and their locations. Although Adobe Reader is ubiquitous among businesses, Docusign has been in the digital signature game for a number of years, and Ascertia Docs offers a similar service. DocuSign offers a number of tools for Business, Personal, Real Estate and other specialty uses. It starts at $14.99 a month for a Pro user and $19.99 a month per Business user, so it comes at roughly the same pricing structure as Adobe's EchoSign with a bit more in the way of mobile functionality. With its mobile app, Docusign Ink, you can log in to your account from any Android or iOS device and create electronic signatures. It's also available as a plugin for Outlook so you can attach e-signatures to your emails. Aren’t there free services that do this? Yes, and SignNow is one of them. It offers many of the same benefits as DocuSign and Echosign, but without a few of the features such as a mobile app or a multi-user interface. For small businesses that only need signatures on contracts once in a while, SignNow is probably the best option. If your needs are more complex, you’ll want to look at one of the paid services. If you have to go for the higher level of service, electronic signatures probably won't save you a lot of money at $14.95 and up per month, but they will save you time by making your process more efficient. For those with an eye on corporate sustainability, they'll also save paper and carbon costs for you and your clients. 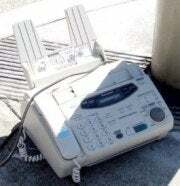 Before trashing your fax machine completely, take a look at the faxes you're still sending in your office and consult with any clients who are still using the fax to contact you. Are they okay with switching to e-signatures? Chances are good that if you walk them through how easy it is, they will be. Larger companies that transmit purchase orders are usually happy to switch to electronic transmission, and one call to their purchasing department will tell you their process. Kick that fax machine to the curb. If you are doing business in the United States, Jason Lemkin of Adobe points out in a blog post announcing the new EchoSign service that digital signatures using EchoSign are "protected by the Federal E-SIGN Act in any legal context in the United States." The Electronic Signatures in Global and National Commerce (E-SIGN) Act covers all electronic signatures, giving them the same binding nature as pen-and-paper signatures. If you are doing business anywhere else, laws governing electronic signatures vary from country to country, so it's best to check before adopting the technology in your business. If you do choose to go with a premium service like Adobe EchoSign’s Global Electronic Signature Service, its system takes international laws into account.